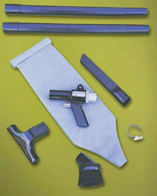 The Vac-u-gun is a low cost solution to a wide variety of industrial housekeeping problems. 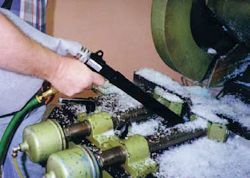 It is a vacuum gun, a blow gun and a transfer tool all in one. Lightweight and easy to use, the Vac-u-Gun has durable die cast construction with no moving parts to wear out. 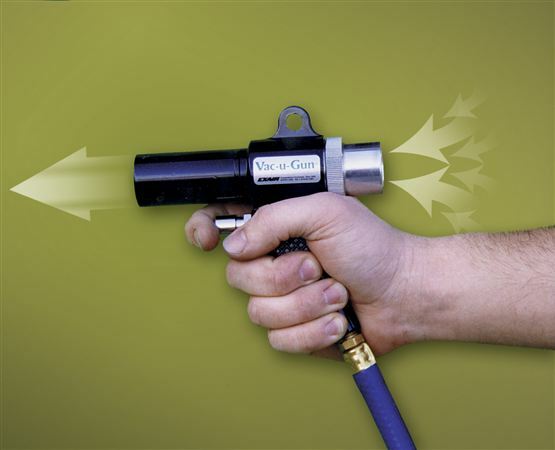 The Vac-u-Gun offers a more efficient way to blowoff, cool, dry and clean. In vacuum mode, work surfaces can be easily cleaned by vacuuming the debris away instead of blowing it off the surface only to sweep it up later. 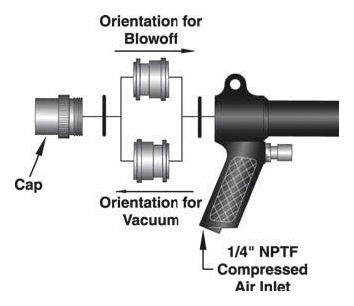 In blow mode, the Vac-u-Gun has a large 1¼" diameter that allows it to cover more surface area in less time compared to ordinary air guns. Transferring materials over long distance is also possible using the smooth bore vacuum hose. 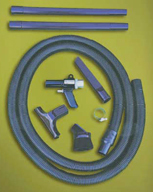 Three Vac-u-Gun Systems with tools are available. 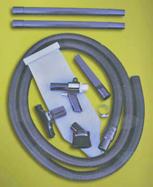 Model 6192 Collection System includes Vac-u-Gun, re-usable bag, brush, crevice tool, skimmer tool and (2) extension wands. Model 6292 Transfer System includes Vac-u-Gun, 10' (3m) vacuum hose, brush, crevice tool, skimmer tool and (2) extension wands. Model 6392 All Purpose System includes Vac-u-Gun, re-usable bag, 10' (3m) vacuum hose, brush, crevice tool, skimmer tool and (2) extension wands.